Freediving Gold Coast Club is the longest running pure freediving club on the Gold Coast. We have been training at the Gold Coast Aquatic Centre since it was officially opened on the 15th September 2014. In fact, our freediving club was at the official open day. In those days we kept it simple and called ourselves after what we did – Freediving Training. There are no annual membership fees to be a member of the Freediving Gold Coast Club. It is automatic for all students completing a freediving course and achieving an international certification with Freediving Gold Coast. For those wishing to join from alternate certification agencies, a crossover course to AIDA can be arranged. There is no charge to train in our freediving club except the pool entry fees or lane hire. All members of Freediving Gold Coast Club are certified freedivers who know and have practiced established safety protocols. It’s comforting to know that your buddy knows what you know. Freediving Gold Coast Club is the only freediving club in Australia where ALL students have participated in an internationally recognised education program. We do not allow uncertified freedivers to train with us because it is unsafe for you. Our freediving club has qualified instructors (that is, certified to be an instructor by AIDA International, the world’s biggest freediving organisation) and are certified in monofin freediving who supervise freediving club activities. 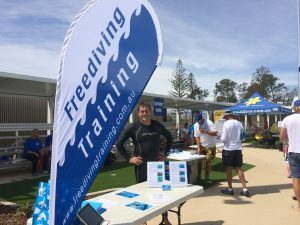 Freediving Gold Coast Club practices the highest safety standards of any freediving club in Australia and adheres to the Freediving Pool Standards Code. Our freediving club is, to the best of our knowledge, the only freediving club in Australia employing an AIDA Instructor with a degree in exercise science , a sport psychology background and is in fact a registered psychologist. All freediving club training is based on sound exercise physiology principles. Freediving Gold Coast Club is the only freediving club in Australia that runs three international freediving mini-competitions per year. How can we do this? Because our instructors are also AIDA International Judges. Stay turned for more details in 2018. Freediving Gold Coast Club members receive discounts on entry to all our international mini competitions. We might never be the biggest freediving club in Australia because of our strict safety standards but there are considerable benefits to being a member of the Freediving Gold Coast Club. A typical pool session in our freediving club simply involves finding a buddy of similar level to practice static or dynamic training. It is the opportunity to put into practice what you have already learnt in your freediving courses. 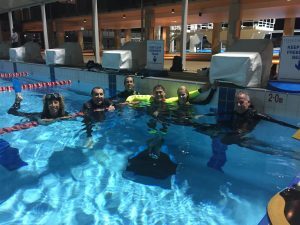 Freediving Gold Coast Club is the opportunity to buddy up and safely train with other freedivers to improve your ability and technique. Many of our freediving club members go on to successfully complete advanced freediving courses, go on freediving vacations overseas or even enter into freediving competitions. Come along to just to have fun in the water and meet other like minded people. Please enquire for the days and times of Freediving Gold Coast Club training evenings. 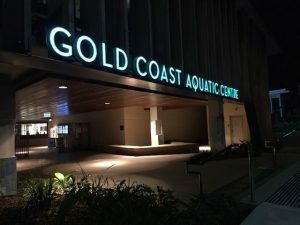 Presently the Gold Coast Aquatic Centre charges $6.00 for a single casual entry to the pool. Freediving Gold Coast recommends the more economical method of 25 pool entry pass. For an up to date list of pool entry costs click on this link http://www.goldcoast.qld.gov.au/thegoldcoast/fees-charges-23182.html. In particular you will need plastic coated weights so as not to damage any pool surfaces during freediving club training. 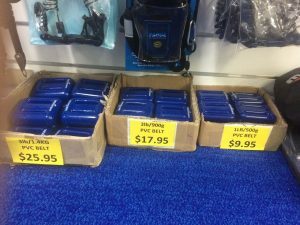 We recommend the Land and Sea PVC coated 0.5kg dive weights which can be purchased online from Squizzy’s Online for $9.95 for each 0.5kg dive weight. (click here to be redirected to their website),or can be purchased on the Gold Coast directly from Sportys Warehouse Water Sports Department (see attached picture of the weights they offer). A diver depending on their body size and the thickness of their wetsuit will likely require 2 to 4 of these dive weights. We recommend the smaller 0.5kg weights to allow easier adjustment of buoyancy and a more streamlined shape (and less water resistance) through the water. 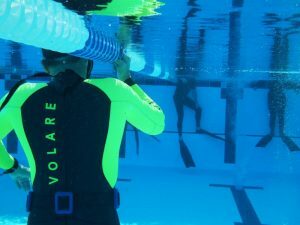 The best entry level wetsuit for our freediving club training activities in the pool and the most economical available (priced at a very reasonable $189) is the Volare V1 Wetsuit – available in both male and female sizes. This is a very good price for a freediving pool wetsuit anywhere in the world – best part? They’re local. While the wetsuit has been developed for swimming and triathlons, the 2mm and 3mm thickness makes it suitable for freediving. The neck lining is also reinforced (an area on freediving suits prone to tearing). Its neck shape also lends itself to less water sneaking in through the back of the suit if your arms are overhead. The wetsuit consists of 2mm Yamamoto neoprene in the arms and legs and 3mm in the body. Click here to be redirected to their website. This wetsuit is also suitable for freediving in tropical waters where temperatures are 27 degrees centigrade or higher. The yellow sleeves are bright which, again, makes for an added safety feature in the pool complex when that unsuspecting swimmer creeps over into your lane during freediving club training – hasn’t acknowledged your safety signs and hasn’t looked for you. If you live on the Gold Coast you can pop into the store in Southport and actually try on the wetsuits (Mon-Fri). Tell them Freediving Gold Coast sent you. They’ll look after you. Finally, to achieve correct neutral buoyancy while freediving in a pool and part of all freediving club activities you will also need a freediving neck weight. This is not a necessity in the beginning of freediving training and any freediving club activities but correct buoyancy really helps dynamic training. While a number of manufacturers around the world now produce them commercially they start from around $100 excluding postage. 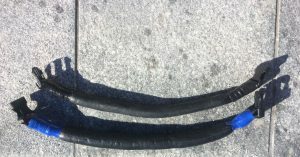 Freediving Gold Coast produce high quality freediving neck weights tailor made for your neck size. We charge a flat rate of $75 for these freediving neck weights irrespective of size or weight. See the attache d picture. If you would like one it is best to try several freediving neck weights at our club night to know what specific weight you will need. Typical weight ranges are from 750 grams to 1.5 kilograms. If you intend to use neck weights in the open ocean they will likely be heavier especially if you are reducing the weights carried on a dive belt. Freediving neck weights for open ocean will often start from 2 kilograms. In the beginning of your freediving pool training and as part of any freediving club activities, any fins are satisfactory, even small swimming fins or scuba fins. In fact, using small or shorter fins has many advantages for pool training as you must work harder to use them, thereby using more oxygen and even developing anaerobic qualities in your leg muscles which is a good thing for freediving. Of course you might swim less distance underwater in the beginning of your dynamic training but you are still working on your breath hold abilities. Later you might want to graduate to a pair of longer freediving fins such as the Omer Stingray Fins which have removable blades if you want to upgrade to fiberglass or carbon blades at a later date. Sporties in Bundell (for those who live on the Gold Coast) or online at their website have these fins available from $175. Click here to be redirected to their website. We believe these are one of the best freediving nose clips on the market today; the 3 Diver Nose Clips. 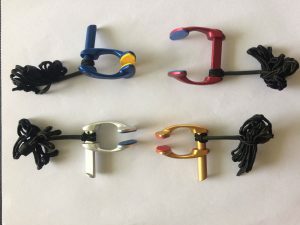 The are extremely durable as they are made out of light weight aluminium which we believe is superior to the majority of other plastic nose clips on the market. These nose clips are also not too bulky and will certainly fit most small to medium noses. If you have a larger nose you might benefit from a more oval shaped nose clip. We sell these nose clips to all Freediving Gold Coast Club Members for $50 (excluding any postage).